On this blog we like to share our travel experience with our audience. We accept guest posts, sponsored posts and guest editorials that are in line with the theme and voice of our blog. We also write guest posts for other blogs. Our blog is about travel. 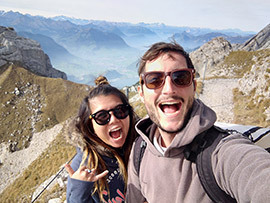 Namely, budget travel, South East Asia, couples travel, independent travel, intrepid travel, motorbike travel, scuba diving, digital nomad lifestyle, living in South East Asia, working in South East Asia and more. Guest posts need to be about these topics or highly related. If you would like to make a guest post on Two Green Backpacks please read our guest posting guidelines. Preferred topics are about adventure travel, travel itineraries, and other travel tips. For example a detailed guide to a particular destination, how to prepare for a certain type of trip, a list of the best places to visit in a certain destination, tips for a certain activity, etc. The best way to organise a collaboration is to contact us with 2-3 topic suggestions. We can then take it from there. We are always open for suggestions, so if you feel like you have a good idea, send it in.